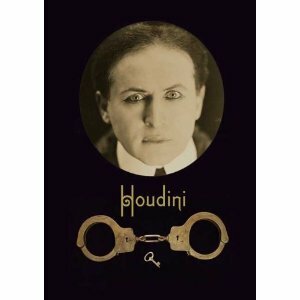 There is currently an exhibit on Houdini at The Jewish Museum in NYC. I've not been, but I did download the very cool APP to my iPhone. So I guess in a way I've attended. For the most part I really liked what I saw. I couldn't help but think that something was missing. A couple things actually. For one, there are many audio recordings by magic celebrities who talk about various facets of Houdini's life. The one who is always missing, actually two who are missing are both friends of mine. Steve Baker, known during his performing career as Mr. Escape should have been asked to record SOMETHING! I know for a fact he's got some hidden knowledge about Houdini, though he won't share it. But when he began his career he duplicated many of Houdini's greatest feats. He's earned the consulting honor. The other person is Norman Bigelow. I mean come on, Norm broke so much new ground on the 'Houdini Punch Theory', but I'm not sure he gets any credit or not as much as he deserves. Both of these guys know escapes and they both know a TON about Houdini! The other person missing is, well, umm, errrr, well, ME! This exhibit is called 'Houdini Art and Magic' and they feature a number of artists who have done works 'related' to Houdini. I use that word related loosely, as one in particular is kind of out there. Don't get me wrong, I still like it and think its cool, but if that one got in, maybe one of my MANY paintings of Houdini could have at least been considered. There are some that have never been seen publicly. You have to admit, some of mine are kind of out there too, lol. Like I said, it would have been nice to be considered. Still, I love the fact that there is a public exhibit to Houdini. It's very exciting and very good for Houdini, historians and magic in general.